It was sunny at home, but out of habit I checked the radar before leaving for the regional cross country meet. It was 36 degrees in Boardman with rain / snow. I knew it would be a muddy mess. I grabbed my Gore-Tex hiking boots, swishy nylon pants, rain jacket and gloves. And a change of clothes. Those spectators who naively showed up in jeans and tennis shoes looked at me with envy. Their shoes would likely be unwearable afterward. 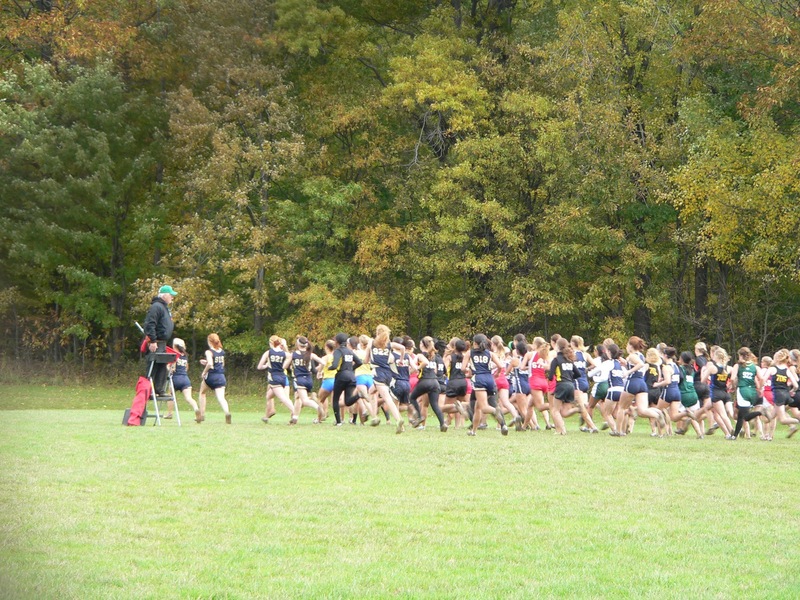 All the rain we’ve had has meant a tough season for area cross country runners. You either got good at running in the mud, or you suffered. Well, you suffered either way, but surely winning made it better. In the (now 5) years of seeing races on the Boardman course, I’ve heard a lot of people complain about it. It’s always wet. But I like it because with a little bit of running myself it’s possible to see the runners at 9 different points during the race. At the start, standing on a hill about 500m from the line, I can barely get the long line of runners in the camera. When the gun fires the long line gradually narrows as the faster runners move to the front. The pack comes toward you like a wave, up and over the first rise. It looks like one giant organism rather than 120 or so individuals. More than a few runners fell during the race. And some normally fast runners had disappointing results. But as they say, it’s the same course for everyone. Those who rose to the top seemed unaware of the bad conditions. They appeared to be running over the mud while others were slogging through it. You’ll notice that I’ve not said anything about being at this race under different circumstances — without the emotional investment of having a daughter there running. That is because I did not want to spend half of my Saturday in an exercise in nostalgia and melancholy. I was there to enjoy the experience of the big meet and cheer for her former teammates. Which is how it worked out. At the end of the race I was pretty well covered with mud too. I didn’t think about it at the time, but on the way home I realized there was a fitting end to the day: in the interest of avoiding turnpike tolls, I had left the course through a different exit than before, and was taking a different route home. I’m usually pretty friendly to other riders out on the road. If I pass someone I say ‘hey how’s it going’. Same if I’m out riding slow and someone passes me. I figure I don’t need to prove myself by trying to ‘race’ them, even if that is what they are trying to do. But every once in a while someone bugs me. Like today. I’m out for a short ride after work, going up a little hill at a comfortable pace, when some dude comes by me pretty fast. He doesn’t say anything, but gives that little look that says “ha, I’m beating you’. Like how Lance gave Jan Ullrich “The Look”. Well, on this day at least, I’m in no mood for that. I’ve got to head back for an after-work function, which means my ride is cut short. So without thinking I slam it in the big ring, catch the guy, then attack like it’s the last lap at RATL. No looking back. Just hammer until I turn and head back towards work. Yesterday’s weather was exactly the same as the fourth Saturday in October 2010. I know this because it’s the weekend of the high school district cross country meet, and I remember every detail from last year. It’s been like this each Saturday in September and October. Only it’s not “the same” as last year. For the first time in 4 years I’m not going to all the meets to watch my daughter and her team. Saturdays have not felt right. It’s kind of like when the bike racing season ends and you’re wondering what to do with yourself. Only with bike racing there will be a “next season” not that many weeks away. There are no more next seasons for watching my daughter run with her high school team. I went to the district meet, to watch her former teammates run. I realized that I miss the whole atmosphere of the big meet: the nervous anticipation, the intensity of the race, the smiles and tears after the race. I never fail to get goosebumps when the starter’s gun fires and the big pack of runners takes off. In the heat of the race — running out to the far point on the course, taking pictures and cheering the runners — I wasn’t thinking about my daughter not being there. It was only after leaving the race that I started to think about it. I don’t want to feel like I’m trying to hang on to a piece of something that is gone. Maybe there is some element of that, but daughter or not I find these competitions to be compelling to witness. The team advanced to the regional meet, which is even more intense as it means a potential trip to the state meet. Now I’m supposed to say something about how fast it all goes by, and how parents should treasure every moment they have while they can. The thing is, I don’t think it makes it easier. In fact I think it might make it even harder. If you’re not really involved, then there’s not much of a change. See you at the regional meet.